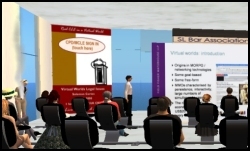 As part of the SL Bar Association’s speaker series, Kate Fitz (Second Life’s ‘Cat Galeilo’), is presenting “Web 2.0 for Lawyers” in Second Life Saturday, November 22 at 12:00 Noon Pacific time. Fitz, who is a public law librarian in Sacramento, California and member of the California bar, serves as the SLBA’s Vice President of Communications.? She also runs the Lawspot Virtual Worlds Law Library.? Fitz previously presented a well-attended and informative SL Bar Association seminar on online research tools for attorneys. Like all SL Bar Association seminars, this seminar is free to attend. For those who would like to earn California Continuing Legal Education (CLE) credit for attending, one hour of credit is available for $25.? The seminar is open to everyone, though it will be most interesting to attorneys and law students.? Kate is a great presenter, and I’m certain attendees will come away with some solid new ideas for practice development leveraging Web 2.0 technologies. You can sign up for a free spot at the seminar and also sign up and pay for CLE credit at the SL Bar Association’s site.? Attendees who want CLE credit can pay for it via PayPal or in-world in Second Life, using Linden Dollars. There’s an interesting post over at Not Possible In Real Life asking the question: “What is the correct (and legal) way to attribute photography and video shot in virtual worlds?” I was going to leave a comment there, but there’s really no way to answer this question off the cuff, so I’m turning it into a post instead.? You should definitely visit the post at NPIRL too, particularly for the ethics of the situation; I’ll focus on the legal questions here.? The bottom line?? At least under the law as it currently stands, in-world shutterbugs need to be very careful — more careful than they would be in real life. Here’s the setup.? 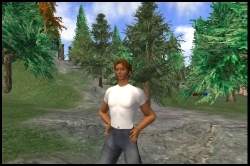 In a virtual world like Second Life, users have the ability to create things (like buildings, clothing, avatar appearances, and more) and the users retain intellectual property rights in these creations.? Users can also take screenshots of this world, including these creations.? So one user makes a 3D building in a public part of the world using the world’s creation tools, and then she logs off.? The building, of course, stays in the world, since that’s the whole point of persistent spaces.? Later, another user comes along and takes a screenshot of that building with a model-avatar standing in front of it.? The model is wearing a red dress, a complex hairstyle, and a “skin,” all from different content creators. It’s awfully tempting to drop back to real life for an answer.? After all, the virtual world looks a lot like the real one.? And in real life, photographers can take pictures of many (though not all) things without worrying about a copyright lawsuit.? The problem is, that may not translate to the virtual world.? We have to take a look at what copyright law actually protects to see why. So in real life, copyright law generally prohibits a photograph of a model sitting on the Spoonbridge and Cherry sculpture, a model embedded in a film cell from Titanic, or a model posing with poster-sized blowups of pages of text from my book, Virtual Law.? But the scene with the model in a red dress in front of a building on a public street?? In real life, that’s probably just fine. That’s because copyright law generally does not protect real-world clothing (because it is deemed a “useful article“) nor does it protect hairstyles and makeup (because they are not “fixed in a tangible form of expression”).? And though copyright law does protect architecture (at least for plans for and designs of buildings constructed after December 1, 1990), taking pictures of and creating artistic works using buildings that are ordinarily visible from public places is specifically allowed. These limitations on copyright law may not mean much in the virtual world, however. Real world hairstyles and various components of individual appearances are generally not protected by copyright because they either are not enumerated in the code, because they are not “fixed in a tangible medium,” or, regarding certain personal appearance attributes, because they do not represent “creative works.”? Dresses and other clothing designs are not protected because they are “useful articles” and copyright law only protects “creative works.”? Buildings have special rules that protect their designs, but these rules do not protect them from photography or other artistic interpretation when they can be viewed from public places. If I’m a content creator, I’m going to argue that when I am making something in Second Life, I am functionally writing code using the graphical interface Linden Lab provides me, and that code should be protected.? Alternatively, I’m making digital art using tools that are only trivially different than those in a program like Sports betting football best appMaya or Blender.? For some creations (such as virtual world animation packages that cause certain expressions and sounds) the code is obvious; the scripts are written in a formal scripting language.? For others, such as buildings, the code is relatively hidden, but there is a good argument that building a skyscraper in Second Life is just “coding” one using a graphical user interface that operates as an overlay on the code, or that it is, at minimum, no different than any other creative work made using software.? Certainly, no one disputes that artistic creations built using software (such as most of the second Star Wars trilogy) are protected works. Many of the comments following the post on this at NPIRL that got me thinking about this in the first place speculate about just how much attribution is necessary when incorporating other people’s work into one’s derivative creations, but I think that the question is largely irrelevant.? If you want to incorporate somebody else’s artistic work into your own you are supposed to seek permission from the copyright holder.? And if you don’t, the copyright holder can sue you — attribution, no matter how extensive, is simply not enough. There are exceptions to this, of course, which generally get lumped together in the catch-all concept of “fair use.”? These include criticism (which I’d argue covers my use of screenshots of in-world scenes in this article) and parody.? The scope of fair use is beyond this article, but for readers who are interested in learning more, the Wikipedia entry on fair use is a good place to start, particularly the list of common misunderstandings of fair use. The easiest way for a content owner to deal with potential infringement is probably via the Digital Millenium Copyright Act (DMCA) policy of the site where content is hosted.? For a private site, that’s probably the site’s web host, and for third party content hosting sites like Flickr and YouTube, the site provider itself typically offers DMCA takedown procedures.? Linden Lab, of course, has a DMCA policy that would apply to in-world objects in the event that a creator wanted to have in-world screenshots removed. Finally, I must stress again that this issue has not come directly before a court.? Some argue that the law should be changed, and that could happen.? The 2D internet has already challenged the bounds of copyright law, and the 3D internet is bound to take that debate in entirely new directions.? This is one of those interesting areas where there could actually be new law created to apply to virtual spaces, or where established law might be interpreted in a non-traditional way. For now, though?? Virtual world content creators — from virtual dressmakers to virtual architects — enjoy protection from virtual photographers creating derivative works based on screenshots of their creations that exceeds the protection afforded their real-life counterparts. 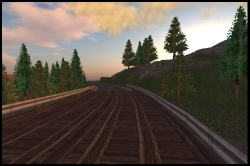 The Polska Republika has launched as the newest self-governance project in Second Life.? Here’s the Polska Republika website, and, since it’s entirely in Polish, here’s a traditionally suspect Google translation. The Polska Republika has posted a Constitution (here’s the translation).? This is fairly clearly not an attempt to recreate modern Poland — among other discontinuities, there is a Queen, whose face is carved on the front of her palace. There are three new filings in the SLART trademark suit.? First, Philip Rosedale and Mitch Kapor have filed a Motion to Dismiss (.zip, w/exhibits) arguing that Minsky’s fraud claims lack sufficient specificity.? Minsky has responded (.zip, w/exhibits), and has also filed an Answer (.zip, w/exhibits) to Linden Lab’s counterclaims. There’s not too much to say about this round of filings. The motion to dismiss the fraud claims against Rosedale and Kapor was expected.? Because of historical misuse of fraud claims, plaintiffs must plead fraud “with specificity” alleging specific fraudulent statements and explaining why the statements are fraudulent.? VB does not speculate on rulings in active cases, but I will note generally that fraud claims are often dismissed on these grounds. Minsky’s formal Answer to Linden Lab’s counterclaims is fairly straightforward, generally consisting of boilerplate affirmations and denials, as is traditional in formal Answers in U.S. legal proceedings. ? Minsky, who represents himself in this action, does include more argument in his Answer than is typical — for example, Minsky admits that he agreed to the Second Life Terms of Service, as Linden Lab alleges, but then argues that another court found the TOS in part unconscionable — but otherwise the Answer is unremarkable. Up next?? The beginning of discovery, and a likely decision from the court on Minsky’s earlier motion alleging that Linden Lab is not in complaince with the preliminary injunction the parties agreed to covering SLART infringement claims while this case is pending.